Rented any good books lately? One of the toughest things about being me is wrestling with the fact that I really do have the answer to everything. 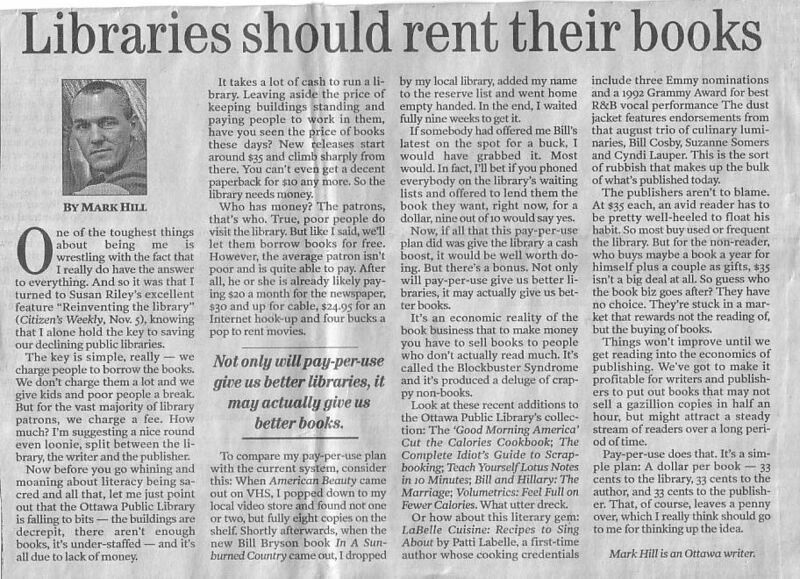 And so it was that I turned to Susan Riley's excellent feature "Reinventing the library" (Citizen's Weekly, Nov. 5), knowing that I alone hold the key to saving our declining public libraries. The key is simple, really — we charge people to borrow the books. We don't charge them a lot and we give kids and poor people a break. But for the vast majority of library patrons, we charge a fee. How much? I'm suggesting a nice round even dollar, split between the library, the writer and the publisher. Now before you go whining and moaning about literacy being sacred and all that, let me just point out that the Ottawa Public Library is falling to bits — the buildings are decrepit, there aren't enough books, it's under-staffed — and it's all due to lack of money. It takes a lot of cash to run a library. Leaving aside the price of keeping buildings standing and paying people to work in them, have you seen the price of books these days? New releases start around $35 and climb sharply from there. You can't even get a decent paperback for $10 anymore. So the library needs money. Who has money? The patrons, that's who. True, poor people do visit the library. But, like I said, we'll let them borrow books for free. However, the average patron isn't poor and is quite able to pay. After all, he or she is already likely paying $20 a month for the newspaper, $30 and up for cable, $24.95 for an Internet hook-up and four bucks a pop to rent movies. To compare my pay-per-use plan with the current system, consider this: When American Beauty came out on VHS, I popped down to my local video store and found not one or two, but fully eight copies on the shelf. Shortly afterwards, when the new Bill Bryson book In a Sunburned Country came out, I dropped by my local library, added my name to the reserve list and went home empty handed. In the end, I waited a full nine weeks to get it. If somebody had offered me Bill's latest on the spot for a buck, I would have grabbed it. Most would. In fact, I'll bet if you phoned everybody on the library's waiting lists and offered to lend them the book they want, right now, for a dollar, nine out of 10 would say yes. Now, if all this pay-per-use plan did was give the library a cash boost, it would be well worth doing. But there's a bonus. 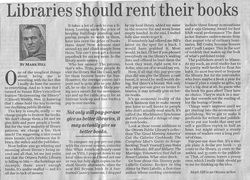 Not only will pay-per-use give us better libraries, it may actually give us better books. It's an economic reality of the book business that to make money you have to sell books to people who don't actually read much. It's called the Blockbuster Syndrome and it's produced a deluge of crappy non-books. Look at these recent additions to the Ottawa Public Library's collection: The 'Good Morning America' Cut the Calories Cookbook; The Complete Idiot's Guide to Scrapbooking; Teach Yourself Lotus Notes in 10 Minutes; Bill and Hillary: The Marriage; Volumetrics: Feel Full on Fewer Calories. What utter dreck. Or how about this literary gem: LaBelle Cuisine: Recipes to Sing About by Patti LaBelle, a first-time author whose cooking credentials include three Emmy nominations and a 1992 Grammy Award for best R&B vocal performance. The dust jacket features endorsements from that august trio of culinary luminaries Bill Cosby, Suzanne Somers and Cyndi Lauper. This is the sort of rubbish that makes up the bulk of what's published today. The publishers aren't to blame. At $35 each, an avid reader has to be pretty well-heeled to float his habit. So most buy used books or frequent the library. But for the non-reader, who buys maybe a book a year for himself plus a couple as gifts, $35 isn't a big deal at all. So guess who the book biz goes after? They have no choice. They're stuck in a market that rewards not the reading of, but the buying of books. Things won't improve until we get reading into the economics of publishing. We've got to make it profitable for writers and publishers to put out books that may not sell a gazillion copies in half an hour, but might attract a steady stream of readers over a long period of time. Pay-per-use does that. It's a simple plan: A dollar per book — 33 cents to the library, 33 cents to the author, and 33 cents to the publisher. That, of course, leaves a penny over, which I really think should go to me for thinking up the idea.